Get on your bikes and ride! | More blue fabric? Several years ago I bought a bike. I’d not ridden a bike in at least a decade, so I made a couple of crucial decisions when making my purchase, chief of which was that the bike had to be something that aesthetically I liked the look of so that, even if I didn’t ride it very often, I’d feel happy when I did ride it. The result of this was that I bought a bike that is highly unpractical for someone who lives on the top of the hill, but a bike which, nonetheless I love. I try to cycle to and from the station whenever I’ve got a meeting (although not if it’s raining after a rather unfortunate experience), and I have a rule that whatever I’m wearing to the meeting is what I’ll be cycling in. 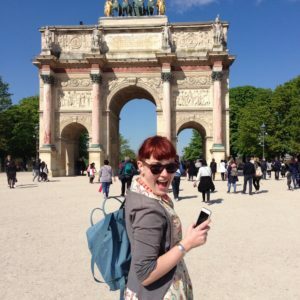 The upshot of this is that I regularly cycle in pretty much all of the things that have appeared on this blog, and I’ve got a bit of a reputation amongst my friends and family for having a bordering-on-ludicrous bike. This dress is the next logical step. No, although some of the bikes have blue frames. The fabric is a quilting cotton that was designed specifically for JoAnn’s. My mum bought it for me on a trip to the States about a year or so ago (maybe longer?). I knew as soon as I was given it that it needed to be a shirt dress, not least because shirt dresses are probably the easiest dresses to cycle in. 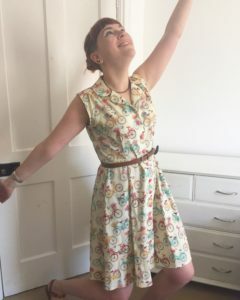 The sleeveless version of the Sew Over It Vintage Shirt Dress. 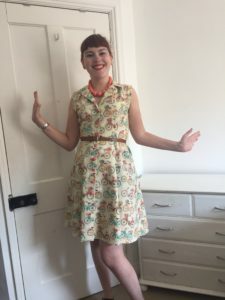 As with the first version of the shirt dress that I made, I was really pleased with how quickly the whole thing came together; for something that could, in theory, be a complicated item to make it’s a really straightforward pattern. 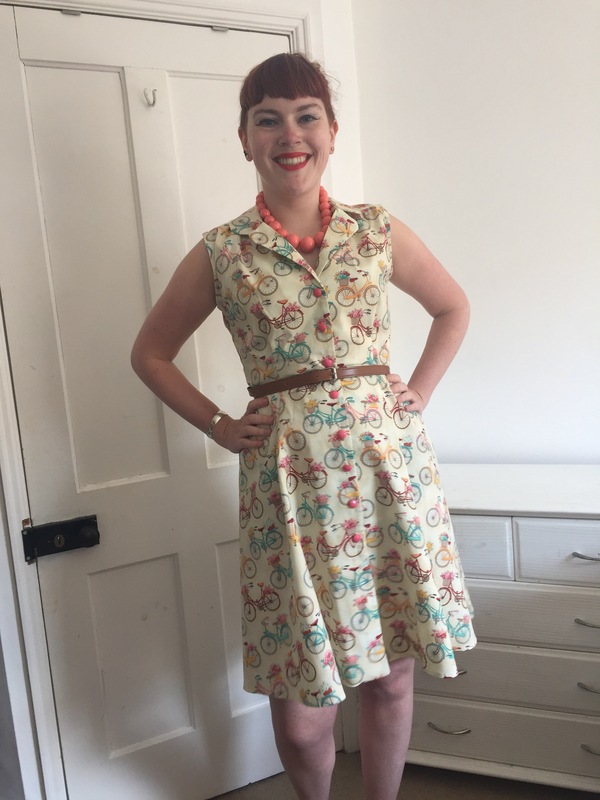 I was also pretty pleased with my economy of fabric; I had slightly less than the pattern called for, but with a bit of unfussy pattern placement I managed to get everything on and all the bikes facing the right way. The buttons for this dress were ones I had in my stash, which meant I didn’t have to buy new ones. This is a victory in itself as I can never seem to find the right buttons I want when I’m looking for them and hours (ok, minutes) of fruitless searching were saved! I spoke last time about how I’d had problems with the collar. I had those problems again. I measured everything up before I cut to make sure that I was definitely cutting the right size and I stay stitched everything to prevent stretching out, but I still ended up with a collar that didn’t fit properly. It’s ended up with the scenario of a slight stick-up on one side which is annoying. It can be fixed with a liberal application of the iron, but I do wish it would just work. I also found that the bias binding bunched around the armhole more than I wanted it to. I’ve since learnt a trick to mitigate this, but, sadly, not until after I had another project with the same problem (more of that another day). I think I would. I’m still concerned about the collar, but I might try cutting just the collar in a different size to see if that fixes the problem. Failing that, I might give a different shirt dress pattern a try, to see if there’s something out there that I’ve missed so far. Recommendations are very much welcome! The classic McCalls 6696 is a great shirt dress which I have made and had no collar problems. 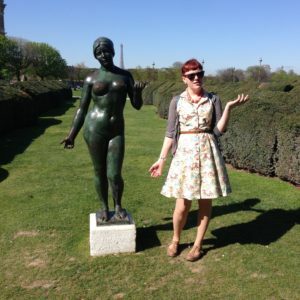 Also, Megan Nielson shirt dress the Matilde gets great blog reviews too. Love the print and think your statue modelling is even better!